PLoDeX is similar to a cool Trojan named W32Blaster which was spreaded a lot in the past. The differences are that it has a better design, and can not easily prevented by changing the time or executing the command shutdown -a ! 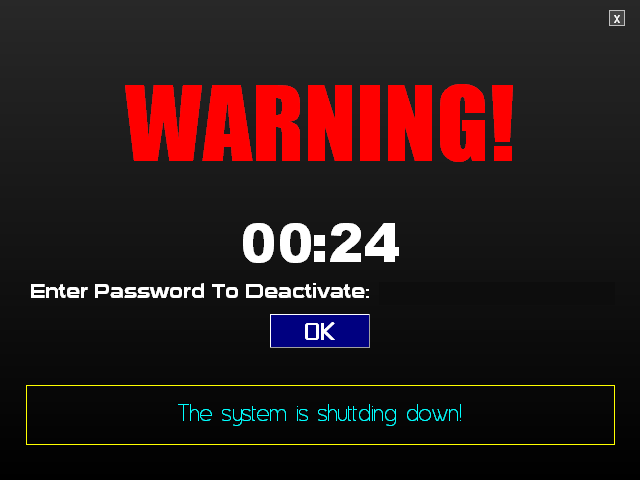 This program is a simple virus that shuts down the computer after 24 seconds, if you don’t enter the correct password to deactivate. This virus can also make the victim panicked by playing the famous 24 sounds for counting the seconds, flashing texts and playing an exploding animation if the bomb is not defused! You can change the time before shutting down, the password to deactivate, and some other configuration, as you wish. For example you might want to configure this virus to remove some needed files to boot the windows before shutting down. This way, Windows won’t be booted again, unless you repair it or install it again. The process name is “csrss.exe”, which causes Windows XP to disallow killing it. Task Manager will be disabled, and also the program keeps itself on top. If the victim tries to close the program without deactivating it, it will enable windows force auto shutdown which can not easily be deactivated by anybody. It also keeps time correctly and prevents the system to change it, so the timer won’t be interrupted. To conclude all, once this program is opened, there is almost no way to disable it without entering the password! The code name was “Warner” originally, but I published the beta version named “Bomber”. Finally I decided to name the project “PLoDeX”. Download the Light version if you just want to turn off the PC and do no harms. Perfect to scare your friends! Download the Malware version if you want to damage a PC by preventing it to boot properly. Perfect to tease your friends! This virus can not be recognized by most famous Antiviruses! ۱) Generate: Download the PLoDeX Config Maker. Enter the desired options and simply press Save. Password: The secret key used to defuse the bomb. SecR and MinR: To declare the remaining time before shutting down.